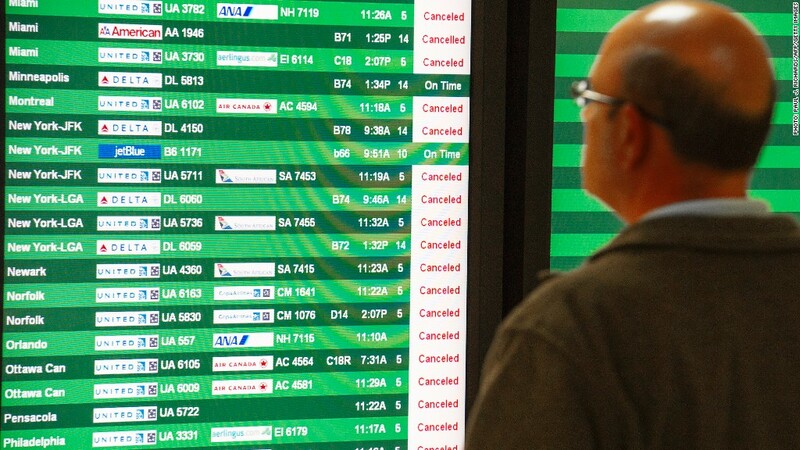 Airline passengers in the Northeast are facing another day of widespread cancellations. Flights to and from the Northeast were still grounded on Tuesday, though there were signs that air travel may slowly return to normal soon. Delta Air Lines (DAL), which had canceled nearly 3,000 flights during the storm, said it was once again flying to and from Washington-area airports on Tuesday. After grounding around 3,700 flights, United Continental (UAL) said that some inbound flights to Dulles International Airport, which serves the D.C. area, might resume Tuesday evening. The world's second-largest largest airline was hoping to start flying to and from New York City again on Wednesday. U.S. Airways (LCC) canceled nearly 2,000 flights, but it is planning to restart operations on Wednesday at airports in Philadelphia, Washington, Boston and some other cities, according to spokeswoman Liz Landau. The airline won't begin serving New York City and New Jersey until Thursday at the earliest. Washington's Dulles and Ronald Reagan airports said on their websites that they "weathered Hurricane Sandy without damage or flooding." They cautioned that staffing at the airports remains "minimal," and the airports advised passengers not to go to the airports to rebook flights -- they should book new flights remotely instead. 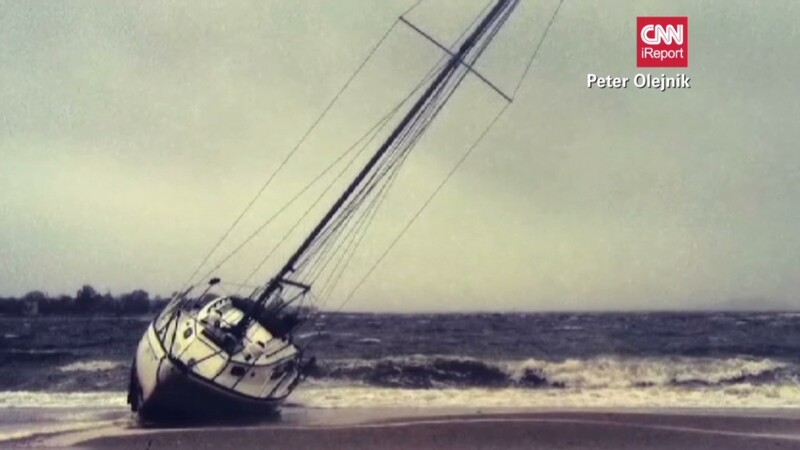 Hurricane Sandy made landfall in New Jersey on Tuesday, causing extensive damage to the Jersey coast and New York City. Airports serving those areas - Newark International Airport in New Jersey and JFK International Airport and LaGuardia Airport in Queens, N.Y. - took a beating. New York City Mayor Michael Bloomberg said on Tuesday that all major airports serving the metropolitan area would remain closed Tuesday with no flights coming or going. New York Governor Andrew Cuomo said he did not expect LaGuardia to reopen Wednesday "due to extensive damage." The impact from Hurricane Sandy is widespread, with flight cancellations stretching westward as far as Chicago, Pittsburgh and Cleveland. FlightStats, a company that tracks information in the airline industry, said that 17,062 flights had been canceled in North America as a result of the storm. Philadelphia International Airport led the way with 1,066 cancellations, followed by Newark, LaGuardia, Ronald Reagan, JFK, Dulles, and Boston's Logan International Airport. The airlines most severely impacted by the hurricane, including United, Delta, JetBlue (JBLU), U.S. Airways and American Airlines, are mostly allowing customers to reschedule storm-affected flights free of charge, though each airline has slightly different rules. American has the most liberal policy, allowing customers to get full refunds for flights or to switch to different carriers. Switching to rail travel isn't much of an option for travelers in the Northeast, after Amtrak suspended service in the area on Tuesday. Trees falling on the tracks and problems with the overhead electrical power system wreaked havoc on the rail system. Amtrak said that a decision on restoring "limited service" north and south of New York City would be made on Wednesday.